How do I start this adoption? I was actually clicking link of donation to Haiti cases. 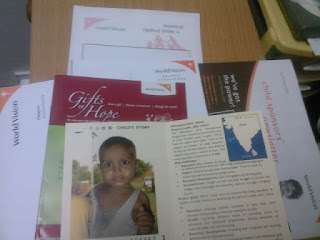 Click click and clicked into World Vision Web Site. I had already wanted to start adoption for a long time ago, just that I cannot afford. well..you just need to click and fill in your details only. Very easy. And u can choose the payment type either quarterly, monthly or yearly. Just after I contribute my 1st donation last week, I received a package yesterday. 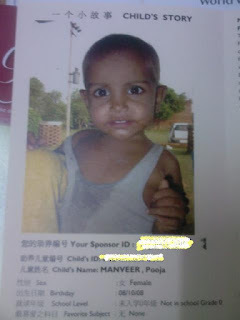 Manveer, who will be my adoption child (F), who is born on 2008. She has cute big eyes, beautiful features. I'm glad that I have this adoptions. Many children still need our help. Dear Manveer, u have to 'sang sang seng seng' ah~ma ma love u~ muacks! ah pei ... hmm i should ask u back to unicef.. haha .. cos i just knew wat the diff unicef and world vision .